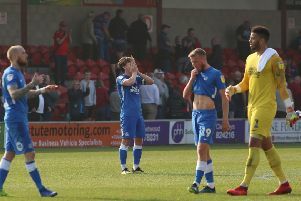 Marcus Maddison (left) made most Posh appearances in 2017. All the statistics from 2017 (all competitions). Danny Lloyd bagged a hat-trick in the biggest Posh win of 2017 at Tranmere. Anthony Grant picked up more cautions in 2017 than any other Posh player. 4 matches v Bristol Rovers (away), Rotherham (home), Cobblers (away), Southampton U21s (home) & v Woking (home), Fleetwood (away), Bury (home), Bradford City (away). 3 matches v Millwall (away), Bradford City (away), Oxford (away). 5 matches v Bristol Rovers (away), Rotherham (home), Cobblers (away), Southampton U21s (home), Doncaster (away). 6 matches v Oldham (away), Oxford (home), Cobblers (home), Gillingham (home), Southend (away), Scunthorpe (away). 21,220 v Bradford City (League One, December).